Joint Mobility and Comfort* NOW® Glucosamine & Chondroitin with MSM combines three of the best known nutrients available for the support of healthy joints in one dietary supplement. 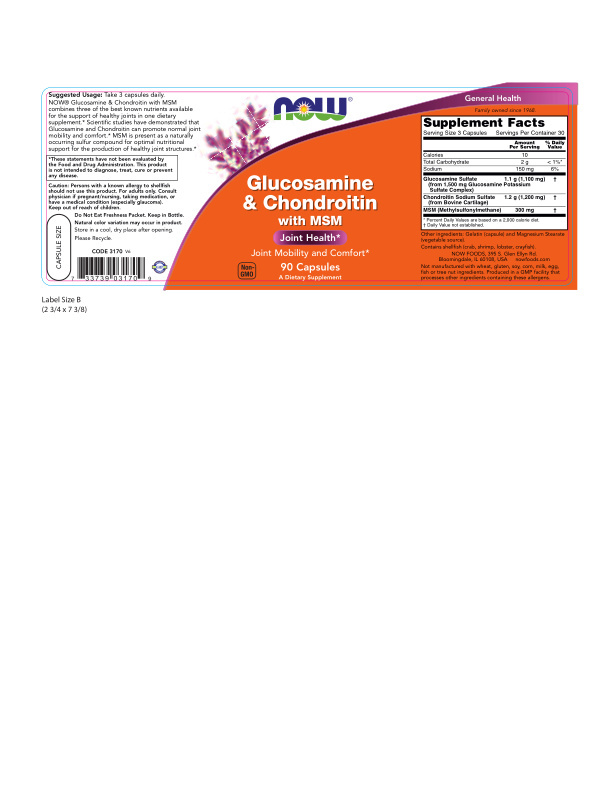 * Scientific studies have demonstrated that Glucosamine and Chondroitin can promote normal joint mobility and comfort. * MSM is present as a naturally occurring sulfur compound for optimal nutritional support for the production of healthy joint structures. * Natural color variation may occur in product. Supplement Facts Serving Size: 3 Capsules Servings Per Container: 30 Description Amount per Serving % Daily Value * Percent Daily Values are based on 2,000 calorie diet.† Daily Value not established. Calories 10 Total Carbohydrate 2 g < 1%* Sodium 150 mg 6% Glucosamine Sulfate (from 1,500 mg Glucosamine Potassium Sulfate Complex) 1.1 g (1,100 mg) † Chondroitin Sodium Sulfate (from Bovine Cartilage) 1.2 g (1,200 mg) † MSM (Methylsulfonylmethane) 300 mg † Other Ingredients: Gelatin (capsule) and Magnesium Stearate (vegetable source). Contains shellfish (crab, shrimp, lobster, crayfish). Not manufactured with wheat, gluten, soy, corn, milk, egg, fish or tree nut ingredients. Produced in a GMP facility that processes other ingredients containing these allergens. Caution: Persons with a known allergy to shellfish should not use this product. For adults only. Consult physician if pregnant/nursing, taking medication, or have a medical condition (especially glaucoma). Keep out of reach of children. Do Not Eat Freshness Packet. Keep in Bottle. Natural color variation may occur in product. Store in a cool, dry place after opening. Please Recycle. Family owned since 1968. *These statements have not been evaluated by the Food and Drug Administration. This product is not intended to diagnose, treat, cure or prevent any disease. Persons with a known allergy to shellfish should not use this product. For adults only. Consult physician if pregnant/nursing, taking medication, or have a medical condition (especially glaucoma). Keep out of reach of children. Do Not Eat Freshness Packet. Keep in Bottle.